Buy Plamil Organic Fairtrade Dairy Free Alternative to Milk Chocolate 80g in the UK from our online shop or directly from our independent Scottish store. This organic dairy free alternative to milk chocolate bar is vegan chocolate and is also dairy free and gluten free. This dairy free chocolate bar is a delicious blend of cocoa solids, sugar and rice powder. Plamil chocolate is made in a nut free environment. Due to limited space we only keep some Plamil dairy free chocolate bars in stock. We can, however, order the full range in. Please phone (01786-464903) or visit the shop (29 Dumbarton Road, Stirling) for more information. These rocky roads are a vegan version of the classic rocky roads which normally contain butter and milk chocolate. By using coconut oil and vegan milk chocolate you can still have a tasty vegan rocky roads treat! This recipe contains 100g Plamil milk chocolate, broken in pieces. We sell real Plamil and other Chocolate directly from our shop in Scotland and online throughout the UK. View more products from Plamil. Where can you buy real Dairy Free Milk Chocolate safely online? If you are wondering where you can buy Plamil Organic Fairtrade Dairy Free Alternative to Milk Chocolate 80g safely online in the UK, then shop with us. 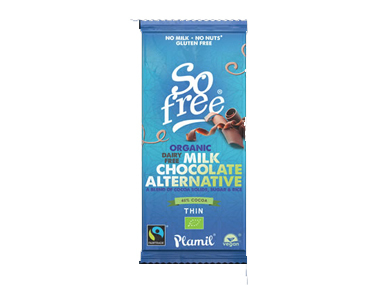 Dairy Free Milk Chocolate - Plamil Organic Fairtrade Dairy Free Alternative to Milk Chocolate 80g in Chocolate and Confectionery.